Stephen Harper made his phony apology to Canada's first nations back in June: at the time, I pointed out what a ludicrous example this was of not putting his money (or support) where his mouth is. It was an arrant act of hypocrisy in the context of his government's prejudicial acts against indigenous peoples, and its on-going pattern of neglect. And indeed the shame goes on. I didn't get Cameron's memo, so I came to this issue fairly late and have little to add to the excellent commentaries already made. 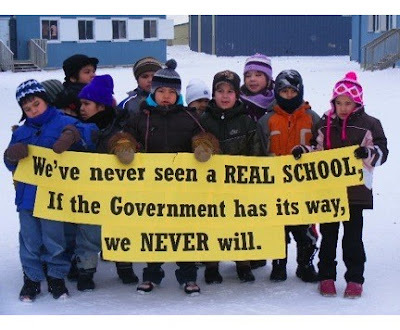 Briefly, the children in the Cree community of Attawapiskat just want a school. They've been fighting for one for eight years, and have been neglected by successive Liberal and Conservative governments. Recently, Indian affairs minister Chuck Strahl nixed it. Indeed, it's worth mentioning that the Liberal record on "Indian affairs" is a disgrace to this country. But the Cons, as always, have gone one better, making a person bitterly opposed to aboriginal rights the Minister of Indian Affairs and Northern Development and Federal Interlocutor for Métis and Non-Status Indians. This is of a piece, of course, with his retention of Maurice Vellacott in his caucus, although his attempt to shoehorn Vellacott into the chairmanship of the Commons Standing Committee on Aboriginal Affairs and Northern Development met with failure. These appointments add context to the frankly racist policies of the current government. Canada was one of only four countries in the world that voted against the United Nations Declaration on the Rights of Indigenous Peoples, upon the instruction of the Harper government. That adds even more context to Strahl's contemptuous thumbs-down approach to Native schooling. How many white kids have to demonstrate to get a school? The kids in Attawapiskat are just more casualties of a government that must never be permitted to obtain a majority. Indeed, they are not alone: forty other first nations communities have no schools for their kids. Come on, Darcey, step up and set an example. UPDATE: Cameron suggests ways that you can help. UPPERDATE: Darcey, bless him, has risen promptly and smartly to my challenge. This page contains a single entry by Dr. Dawg published on August 7, 2008 10:24 AM. Ezra loses another round was the previous entry in this blog. In defence of PETA is the next entry in this blog.